First Violin, Lydian String Quartet. Performance and analysis. Annual solo recitals. Private violin teaching and chamber music coaching. Daniel Stepner is the first violinist of the Lydian String Quartet, a recitalist, a private teacher and a chamber music coach. He is also Artistic Director of the Aston Magna Festival, which does summer concerts at Brandeis, Bard College and Simon's Rock College. He was a Preceptor in Music at Harvard Universtiy for 21 years, was concertmaster of the Handel an Haydn Society Orchestra for 24 years, and a founding member of the Boston Museum Trio at the MFA for 30 years. Irving Fine Concert. By Irving Fine, Harold Shapero, Béla Bartók, Claude Debussy. Violinist Stepner, Daniel. Slosberg Auditorium, March 9, 2014. Stepner, Daniel, Victor Sachse. 20-Century Masterworks for Solo Violin. Centaur Records, 2014. Stepner, Daniel, Victor Sachse. J. S. Bach The Sonatas and Partitas for solo violin, and Chromatic Fantasy and Fugue (arr. D. S.). Centaur Records, 2014. Stepner, Daniel. John Harbison: The First Four String Quartets (with the Lydian String Quartet). Centaur Recods, 2010. Stepner, Daniel. Performer. Rameau: Piéces de Clavecin en Concerts, and two cantatas, ("Orphée," and "L'impatience"). Centaur Records, 2010. Stepner, Daniel. SEE C.V. for complete recordings list (too numerous to fill in each one below). 2007. Stepner,Daniel. The Mirror and other chamber music of Yehudi Wyner (CD, grammy nominated). Naxos Records, 2004. Stepner,Daniel. 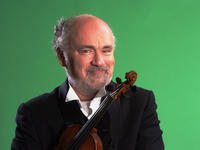 Solo Recording: Charles Ives: Five Violin Sonatas (w/ John Kirkpatrick). HMS Musicmasters, 2003. Stepner,Daniel. Solo Recording: Dietrich Buxtehude: Four Sonatas a Due. Harmonia Mundi (France), 2003. Stepner,Daniel. Solo Recording: J.S. Bach: Complete Works for Violin and Continuo. Titanic, 2003. Stepner,Daniel. Solo Recording: Leo Ornstein: Piano Quintette. C.R.I., 2003. Stepner,Daniel. Solo Recording: Leo Ornstein: String Quartet #3. Serenus, 2003. Stepner,Daniel. Solo Recording: Marin Marais: Complete Works for Violin. Gamba and Continuo, Titanic, 2003. Stepner,Daniel. Solo Recording: Rameu: Pieces de Clavecin en Concerts. Titanic, 2003. Stepner,Daniel. Solo Recording: Telemann: Four Methodical Sonatas. Pro Arte, 2003. Stepner,Daniel. Solo Recording: Vivaldi: Four "Pisendl Sonatis. Harmonia Mundi, 2003. Stepner,Daniel. As Lydian: "Schubert Quartets. Centaur Records, 1993. Stepner,Daniel. As Lydian: "John Harbison String Quartets. Harmonia Mundi Recordings, 1992. Stepner,Daniel. As Lydian: "The String Quartets of Charles Ives. Centaur Records, Inc., 1990.